This would be a great gift for any time of year. When words fail you to express your feelings, you may borrow mine by placing a note or bookmark on a certain page. Choosing one or more that reflects how you love another. There are only poems of love, being deeply in love inspired every poem. My book will leave you with a positive feel good impression. Each was written from my heart. 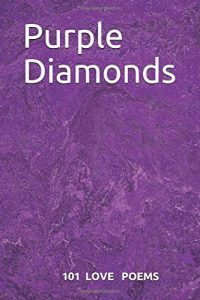 Left for some years in a drawer, I wrote ‘Diamonds In The Rough’, about the process of editing and creating a collection of poetry for lovers and lovers of poetry. You will find it at the back of my book. I live near the coast in Queensland, Australia. This is my first book, other poetry on love, life and grief will fill a second book in the near future. Writing has held my interest more than many other creative pursuits. I have an easel and paint that’s dried and destined for the bin. I used to enjoy pottery and there is a beautiful large owl in my garden I handmade. We should go with what our heart wants and that’s the same in life and love. To truly follow your dreams I believe you just start with one day. Take some small action to realise the dream, It won’t come true while you dream about it. This book is for me that dream turned into a reality.